Eating habits, physical activity, access to parks, ethnicity, poverty, and TV watching all play a role in our national epidemic. The percentage of American children who are overweight or obese has been growing for decades, and now our kids--nearly one in three has a body mass index that's greater than normal. And the problem continues to grow, according to a study published Tuesday, March 8, 2010 in The Journal of Health Affairs. Using data from the 2007 National Survey of Children's Health, the study showed marked regional differences. The five states with the highest rates of overweight and obese kids are all in the Southeast — top-ranked Mississippi (44.4%), Arkansas, Georgia, Kentucky and Tennessee. Minnesota and Utah were tied with the lowest rates (23.1%). But when researchers further divvied up state-level numbers by race and socioeconomic status as well as things such as TV-watching behavior and access to parks, they found even greater disparities. 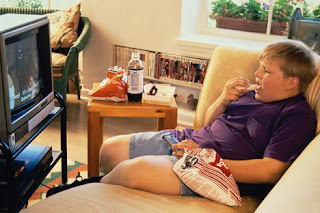 The likelihood of being overweight or obese was greater if a child has a TV in his bedroom or watches more than two hours a day (41% greater odds) or if he lives in a neighborhood without a park or recreation center (21% greater odds).